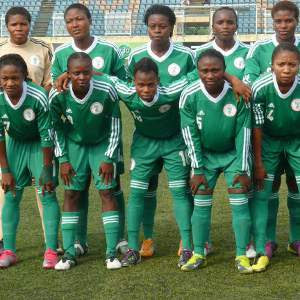 Super Falconet of Nigeria striker, Francisca Ordega has said the DR Congo's Leopardess will not stop them from the 2012 Fifa Under20 Women's World Cup in Japan. Both countries emerged as opponents for the final fixture after wins over their round two foes. The Nigerians defeated the Young Mighty Warriors of Zimbabwe 6-0 on aggregate while the Central Africans whipped hapless Malians 6-3. Ordega said that the nation's campaigners have quality players that will put a stop to the DR Congo's World Cup ambition. The first leg fixture in Nigeria comes up in the second week of May while the second leg is in a fortnight in Kinshasa. The winner will qualify automatically for the World Cup in Japan between August 18 and September 9. So do you think the super falconets will have it easy against the leopardess of DR Congo?